The Markbass LittleMark 250 Black Line Head is a bass amplifier with 250W of power and four-band sound control. 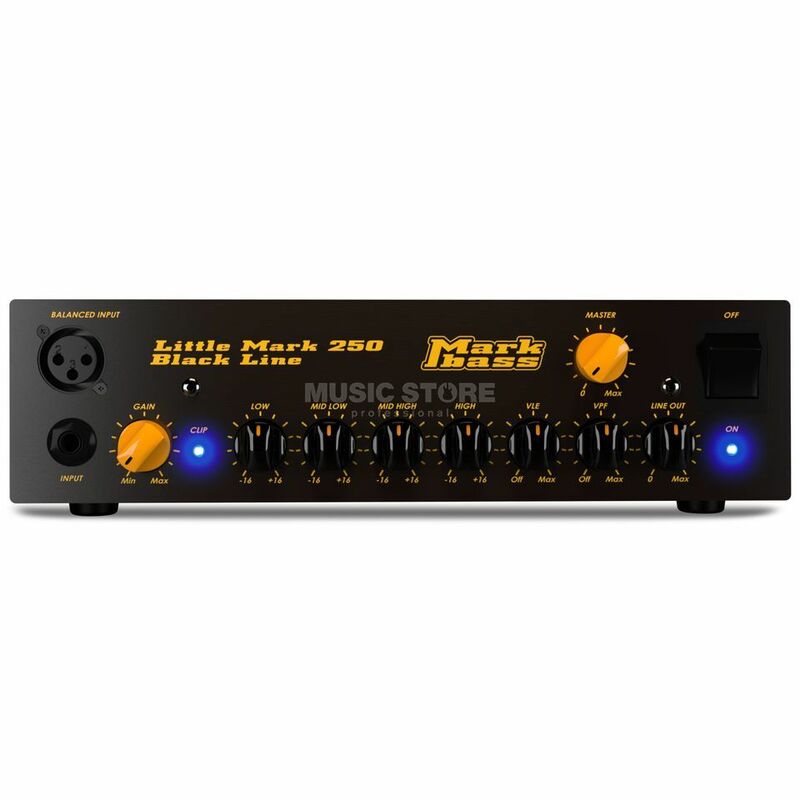 The Markbass Little Mark 250 Black Line bass guitar amplifier head offers the same top-of-line features and cutting-edge technology as its standard Little Mark 250 brother, but in a menacing all-black finish. The Markbass Little Mark 250 Black Line pumps out 250 watts of power at four ohms, or 150 watts at eight, making it the ideal choice for players who want a setup that can be used at home or for those that don’t need the full power of a 500 watt head. This power amp section is accompanied by a four-band EQ pre-amp that covers the entire frequency range of the bass guitar. The pre-amp of the Markbass Little Mark 250 Black Line also features a Variable Pre-shape Filter (VPF) and a Vintage Loudspeaker Emulator (VLE) control. The VPF control boosts low and high frequencies will cutting mids to create a scooped sound that is incredibly effective when playing with a pick or playing slap bass. The VLE control acts as a shelf that cuts a greater range of high frequencies the further it is turned, effectively giving the amp a more “old-school” type of tone. The quality of Mark bass allows me hear all the possibilities that my 6 string Fender Jazz Bass (USA) have. I played blues, soul, funky and metal in totally flat equalization with the filters and with many effects (distortion, fuzz, compressor, octave, flange) and the possibilities are unlimited. Litle Mark 250 with a Mark traveller 102P is a compact solution for play in small places. Come on!! I never put yet the master higher than half because my band doesnt want to hear only the bass!! In one single word... Amazing. This is an impressive little bass amplifier. The controls are simple, the frequencies were very well chosen (especially 10 kHz for silky highs and 40 Hz for earth-shaking lows) and volume is enough for rehearsals or small/medium clubs: I use mine with a 12" 400 w cabinet at 8 ohm and it feels more than 150 w (keeps up with an acoustic drum). VPF is a quick control that works great with slap and VLE sounds nice with my fretless. Well built, low noise, clean D.I. and no heat problems yet (the fan is always quite...). 2,3Kg! Great deal, highly recommended!